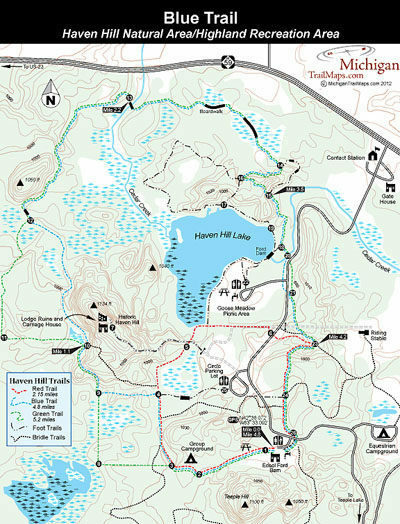 The principal trail in the Haven Hill Natural Area is a loop that encircles Haven Hill Lake with two cutoff spurs that create shorter trails. 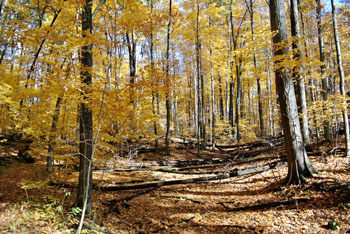 The entire loop is a 5.2-mile hike marked as the Green Trail. Slightly shorter is the 4.8-mile loop marked as the Blue Trail while the Red Trail is 2.15 miles. Mountain bikes are banned from the system and during the winter the loops are popular cross-country ski trails when there is sufficient snow. The drawback is that equestrians share short segments of the system with hikers and Highland Recreation Area is extremely popular with horseback riders. Be prepared for a few horses on the weekends and a more than a few mounds of droppings in the middle of the trail. Of the three loops, the Blue Trail is the most scenic and drier than the Green Trail, which is often wet between posts No. 3, No. 8 and No. 9. All three loops begin at the Edsel Ford Barn parking area. When Ford built the 15,000-square foot barn in the early 1930s it was one of the largest east of the Mississippi River and could house 1,500 sheep. In 2008, two-thirds of the building was blown down by high winds in 2008, but the rest is being restored through the efforts of the Friends of Highland Recreation Area. From the parking area, the loop heads west across a field and near a pair of vault toilets dips into the woods. In less than half mile the Green Trail peels off and the Blue Trail at Post No. 3 and swings north. The scenery gets interesting here with a long descent to post No. 10 where in the fall you occasionally see the Carriage House on top of Haven Hill. Wetlands and wooded hollows follow and even a bit of seclusion. When you reach post No. 12 at Mile 1.7 you are in the heart of the natural area. Wetlands and rolling hills dominate the 1.5-mile stretch between posts No. 12 and post No. 14 and at Mile 2.2 you reach post No. 13 where the trail crosses a bridge over Cedar Creek. There are occasional sounds of traffic from nearby M-59 but for the most part the natural beauty and quiet remoteness you encounter in one of Michigan’s most overdeveloped counties is amazing. At post No. 14, reached at Mile 3.2, the loop swings to the west and post No. 15 it leaves the natural area and heads south for Ford Dam. Ford installed the dam in 1926 to convert a small stream and marshy pond into a waterfowl sanctuary he named Haven Hill Lake. You cross the paved entrance road to Goose Meadow Parking Area and then the park road immediately after that. At post No. 23, reached at Mile 4.2, the Red Trail merges into the main loop. You cross the park road once more just before returning to the Edsel Ford Barn, reached at Mile 4.8. The day-use area at Teeple Lake features a beach and designated swimming area, boat launch on the lake, picnic area and a rental shelter. At the Goose Meadow, on the shores of Haven Hill Lake, there is a picnic area with a shelter, toilets and drinking water. Scattered throughout the old pine plantation of Dodge Park No.10 are picnic tables and a shelter. This day-use area is a picturesque spot overlooking Pickerel Lake. There is a vehicle entry fee at Highland Recreation Area, which is open year-round. 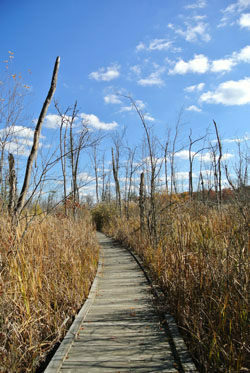 The park drive through Haven Hill Natural Area to Teeple Lake and Goose Meadow is reached from M-59 (Highland Road) 15 miles west of Pontiac. Also providing access into the recreation area further west along M-59 is Duck Lake Road, from which Lower Pettibone and Beaumont roads are reached by turning west onto Livingston Road. For more information contact Highland Recreation Area (248-889-3750; www.michigan.gov/highland) or Friends of Highland Recreation Area.